And so we return to falling damage once again. I'm sure it says something about my intellectual sloth that my eyes just glaze over when I see stuff like this in a roleplaying game. The very idea of having to understand acceleration, terminal velocity, and the like to arrive at a "realistic" representation of falling damage is bizarre enough. To do so as part of an argument against earlier rules is even more baffling. D&D's hit point system doesn't really stand up to extensive scrutiny if "realism" is your watchword. In my opinion, devoting so much effort to "prove" that terminal velocity is reached not at 200 feet as in the Players Handbook system or at 60 feet as in the revision but at 260 feet is a waste of time better spent on making a new monster or a new magic items -- things that actually contribute meaningfully to fun at the game table. But I'm weird that way. Good post, I fondly remember this article as a youth and how it hurt my head to comprehend. Game physics and real world physics certainly differ on a great many things so yes it's a waste of time trying to make them match. In the end, I'm not sure I've ever had a PC die from falling damage and that has more to do with storytelling and less with physics. Certainly, it's a waste of time. Kind of an interesting waste of time, though, isn't it? To make intelligent decisions about ordinary, non-fantastical, non-science-fictional, non-weird things, players need to know how the game's rules work, not just how reality works. And that makes it harder for new players to start playing the game. That's why I prefer RPG rules that accord with reality except in the cases of fantastical, science-fictional and weird elements. So I don't think taking acceleration and terminal velocity into account when crafting a rule for falling damage is in the least bit bizarre or baffling because I see how that contributes meaningfully toward fun at the game table -- by making it easier for players to make intelligent decisions about ordinary things. I am in agreement with Ed Dove's reply. It is a question of plausibility. I think, for some (maybe most), just making damage be 1d6 per 10' is a fair enough approximation. But it definitely is in how the players and dungeon master perceive things. When making a rule, we have to start somewhere. Would James be okay if the rule for falling damage was 200 points of damage per 10' fallen? I would think his answer would be no? Well, why is 1d6 per 10' okay, but 200 points per 10' is not okay? Someone makes a decision on what seems fair enough and usually a good place to start is using the vast body of knowledge we have about the real world. I remember this article and my reaction is probably the same as it was then: why in the Hell would you waste your time writing up this stuff? Why muck things up with a bunch of gobbidy-gook math THAT NOBODY CARE ABOUT? I swear math geeks get a real hard-on about this stuff. blackstone: If no one cared about it, why would someone write it up? I mean, at least the person who wrote it up cares about it. So, basically I agree with Ed Dove and Random Wizard. Because the article is stupid and unnecessary. Unnecessary to you, perhaps. Stupid? Well, that's a matter of opinion, obviously. Me, I don't have much use for it, but some people prefer that sort of thing. Are their preferences then somehow less important than yours? Who are these people who "prefer" that sort of thing? Nobody I've ever gamed with in my 30+ years. I have to chuckle to myself how gamers like to justify this sort of "realism" stuff in a game with dragons, elves, and fairies. "Who are these people who 'prefer' that sort of thing?" Me. Almost everybody I've ever gamed with since 1979. And some of the other people who post here, too. That's who. "Nobody I've ever gamed with in my 30+ years." How very fortunate for you. From what? Other people liking and doing things that you don't like or do? Nope. No break for you. Other people will continue to like and do whatever they want regardless of however you feel about it. "I have to chuckle to myself how gamers like to justify this sort of 'realism' stuff in a game with dragons, elves, and fairies." Chuckle about whatever you want. Other people will still continue to understand how making the mundane aspects of even the most fantastically weird games accord with players' real-world experiences makes those games easier to play and, so, more fun for more people. Or, at least, no one you have gamed with is willing to bring up the issue with someone who calls people with differing opinions about matters of aesthetics "stupid". Ed Dove has covered the rest of the argument quite ably. It's odd, isn't it? D&D is a great way to escape from reality for a couple of hours each week, yet so much effort is spent trying to bring reality back into it. Well, at the very least it's another option to choose. I wouldn't personally use it, but a math genius friend of mine may. I am some-what aligned with Ed on this one. I've spoken with people who are playing 4e at present and the very first thing that turned me off to it was when they said that -- basically -- a character can't get hurt falling down a staircase, out of a second story window -- etc. That's just too much for me. As a former member of the 82nd Airborne Division, I cordially invite each and everyone of you to try it . . . without the parachute. Let me know if you get hurt. Yes, in my game, your character can get hurt -- or even dead -- falling down. It depends upon the fall. Ironically part of what i loved about Traveller was all the formulae and equations. what do you do as a DM? You must misunderstand the idea. 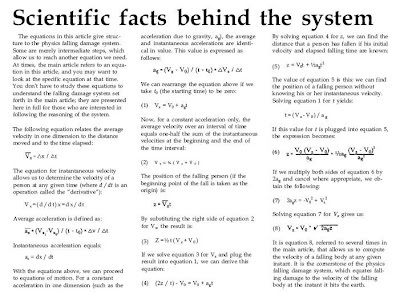 All those equations in the article just show the work of deriving the one equation the referee would actually use. All the referee would do is put the distance fallen into that one equation -- which would calculate the terminal velocity, which would determine how many dice of damage would be taken. Without a calculator, it might take a few minutes. With a calculator, it should take well under a minute. It's not even an equation that gets used in-game, there's just a table at the end of the article; look up distance fallen and roll that many dice. 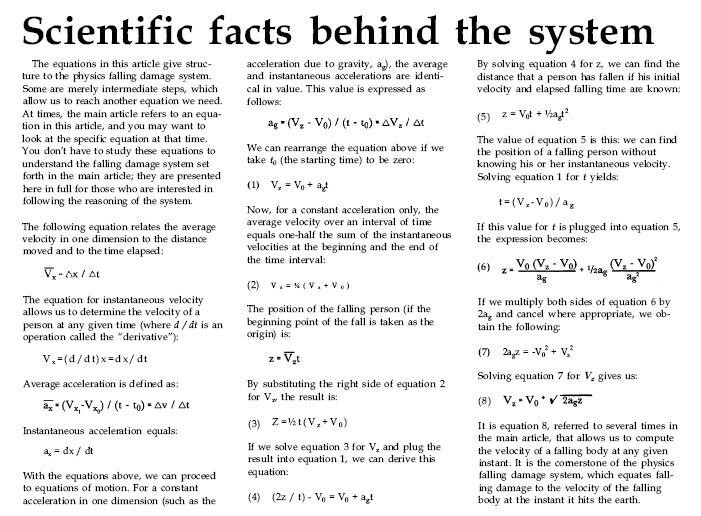 The equations shown are just "showing the work" for where the table comes from. Not even an equation? Just a table? Jeez! Using that wouldn't take more than a few seconds! a few years ago I had a dwarf character in my AD&D group. At 10th level he had 100 hit points (he rolled exceptionally well, and had 18 or 19 Con.) He fell off a 100' high tower, we simply rolled damage per DMG, and he survived. We didn't try to find an explanation, beyond the fact that he was "tough as nail." Matter-of-factly, considering the nature of hit points (and in 4e hit points are more abstract than any previous editions) both 1e and 4e are abysmal failures if viewed as simulations. What one should really do in these cases, is to concoct an explanation ex post as to why the dwarf with 100 hps doesn't die when falling from 100'. Perhaps he falls on a tree, or he bounces off the wall slowing the fall, or he falls on something soft or whatever. Its not so much that the rule is accurate to physics. Its that the rule is accurate and is playable. Idealy it will be both. But if people have to choose between accuracy and playability in games, playability will win every time simply because games are played. When that article landed on Kim's desk, he asked me to look it over because he knew about my background in physics. IMO, the author's premise was flawed from a purely physics angle, aside from the question of whether that sort of analysis was called for. So Kim asked me to write the rebuttal. I tend to agree that applying scientific analysis to D&D is a slippery slope down the rabbit hole. It's important, however, that the rules don't fly in the face of common experience. We'd all rebel, for example, if falling damage was a flat 1 point per 10 feet, because that would lead to ridiculous situations in the game. Most of us are happy as long as the damage feels about right -- not so high that it kills everyone, not so low that it kills no one, and not so far in either direction that it violates our own experience jumping off the garage. Players can argue endlessly whether "about right" should be a d6, d8, d10, or d12. What I wanted my rebuttal to show is that making it a d-something per 10 feet was completely in keeping with common experience. I just did all the math and not only is a d-something per 10 feet fallen in keeping with common experience, it's actually correct physics, too. Falling damage is due to impact energy. And impact energy increases linearly with distance fallen. In The Space Gamer there used to be a set of cartoons, called Murphy's Rules, highlighting amusing and broken rules from many games (although by the end of the series they were pushing it). I'm someone who (perhaps predictably) doesn't see any harm in getting the mundane elements of D&D as believable as possible, and letting the "wahoo" parts sprout off that. I think an argument like Ed's above about expanding RP opportunities is an excellent one; and I'm personally very happy to have Steve's published rebuttal (which I think persuasive, useful, and something I've referred back to many times). There's even some value in just enticing people to learn about the broader world subject areas. And I think there's maybe just a half-dozen parts of core D&D that can take a few fixups and enormously benefit from them. Of course, the "equations" shown would never be used in play at the table. They're just "showing the work" for the chart appearing at the end, where in play you'd look up the distance fallen and roll the indicated dice. I think that lengthy designer discussion is appropriate for a supplemental magazine article like this. Of course, I do the same kind of stuff on my blog; detailed math explanations (for those who want them), supporting published rules which are very terse and hopefully playable. Sometimes I debate whether I should put the produced mechanics at the top of the article, and all explanation after (theorem/proof style), but it usually seems more conversational to do in a format of exploration/playable-mechanic-at-end. On the issue of "To do so as part of an argument against earlier rules is even more baffling", perhaps a counterargument is that this article is itself a response to Gygax's earlier supposed charge that the existing falling rules were a misprint/in need of correction for realism purposes (to cumulative 1d6, 3d6, 6d6, etc.) Once that was in air with the "official" stamp on it, then it probably deserved a complete analysis before becoming the new rule (as seen in Unearthed Arcana). I don't think the "revised" Gygax rules for falling damage are in Unearthed Arcana. Perhaps you are misquoting? Or in case I am wrong, can you provide a reference page? I looked a bit and, while I didn't find Gygax's revised rule for falling damage outright explained in Unearthed Arcana, I did find it used in the passage concerning Thief-Acrobat "falling percentage" on pages 24 & 25. Gygax's revised rule for falling damage is explained on page 19 of the Dungeoneer's Survival Guide and page 35 of the Wilderness Survival Guide. Thanks for the reference Ed! I had completely missed that snippet. I don't have the DSG and WSG so I didn't know it went actually into print as an explicit rule. You're welcome! Always glad to help whenever I can. ^ Ed has it, I was thinking of that section on "Falling" for Thief-Acrobats, specifically the last two sentences in the example that spans UA p. 24-25. I appreciate that many of you enjoy "cheating death" via the game. But we have yet to find anything that isn't killed by decapitation -- despite it's "hit points." There are some who DM "by the Rule books." That's because they have no imagination and shouldn't be DMing to begin with. They need to remain players -- only. I do not need the GUIDELINES laid out in the Core Books to tell me what to do in every situation. But that's just me. We each play our own way. If a Dwarf character -- with 20,000 hit points -- is snatched up by a Dragon and dropped from "X" number of feet -- he's dead. There is no rolling of the dice. Mr James who puts a "scanned" page from Dragon magazine? i can't believe my eyes :) i saw that you were always very careful not getting WOTC angry about copyrighted stuff, and you usually put only the titles of the articles.. There is a point here that I think has been missed. It is not that the rules need to be perfectly realistic, but rather that they avoid being ridiculous. I have no objection to characters (esp. higher level ones) being able to survive (and even walk away from) falls from high places, on occasion. What I find ridiculous is the automatic *expectation* that they can survive, based upon comparing their hit point total against the total dice of damage they have coming... munchkinism at its finest. Look, no remotely rational being, sans appropriate anatomy, magic or gear (i.e. wings, feather fall spell, or parachute, etc.) stands on the edge of a precipice, coolly evaluates their stamina, hardiness, skill, luck, divine favour et al vs. the distance to the bottom, and simply jumps. That is absurd on its face – and any game system that promotes such displays a serious shortcoming. Since surviving a fall of such magnitude is really more a matter of luck or divine intervention then skill, simply assigning gobs of damage dice is the wrong approach. Hit points work best when used to represent resilience in combat, where the full definition as given by Gygax in the 1E DMG is a good fit. In cases like this one, though, whether you are 0th level or 20th level really does not matter so much – the laws of physics apply equally. Happily, the solution is fairly simple. Falls simply should be treated more like, for example, poison – save or die, essentially. Under such a system a 0 level figure actually has a chance to survive a 30 foot drop (which can happen in real life but is logically impossible under the current rules) while a 20th level figure has a good chance to *die* from the same (again, rather unlikely under the current rules assuming no prior damage, etc. ), though of the two the 20th level figure obviously has better odds of surviving. It’s just not *automatic* anymore, nor can they rationally expect to survive just because the fall is so many feet and they have so many hit points. The basic approach, in outline, would simply be a save vs. breath weapon, or maybe petrifaction. If you save, take a token d6 of damage – you are assumed to have landed on something that broke your fall enough to avoid serious injury, the Hand of God caught you, whatever. If you fail, though, you are assumed to be at 0 hit points (N.B. : I consider 0 hits to be more incapacitated then necessarily dead – basically you are out of the fight, as it were, even though you may be conscious). Then make a System Shock roll – if you succeed you are simply incapacitated and very injured. If you fail that then you are actually dead. Obviously, there is room for and even need of some modification. For example, one might want to distinguish between short falls (i.e. 10-20 feet or whatever) or falling down a flight of stairs which are unlikely to be lethal, vs. falls that are much higher and would be difficult for anyone to survive. Or falls on jagged rocks vs. soft loam, etc. One could then modify saving throws or system shock rolls, etc. accordingly. "It is not that the rules need to be perfectly realistic, but rather that they avoid being ridiculous." Exactly! I wish I'd thought of saying it that way. Maybe now some of the "fantasy games don't need no realism" folks will finally understand. "...ridiculous is the automatic *expectation* that they can survive, based upon comparing their hit point total against the total dice of damage they have coming... munchkinism at its finest." Again, exactly! I wish I'd been able to explain all this as well as you have. "...no remotely rational being, sans appropriate anatomy, magic or gear (i.e. wings, feather fall spell, or parachute, etc.) stands on the edge of a precipice, coolly evaluates their stamina, hardiness, skill, luck, divine favour et al vs. the distance to the bottom, and simply jumps. That is absurd on its face – and any game system that promotes such displays a serious shortcoming." Yet again, exactly! Anybody who doesn't understand now must be either incapable of understanding or unwilling to understand. "Since surviving a fall of such magnitude is really more a matter of luck or divine intervention than skill, simply assigning gobs of damage dice is the wrong approach. Hit points work best when used to represent resilience in combat, where the full definition as given by Gygax in the 1E DMG is a good fit. In cases like this one, though, whether you are 0th level or 20th level really does not matter so much – the laws of physics apply equally." You might be right about this, too. I'm going to give it some serious consideration. My one mild rebuttal is to point out that, because part of what 2nd-level+ hit points represent are luck & divine favor, it's at least not completely ridiculous to determine the results of falls with a hit-point-based mechanism. "Falls simply should be treated more like, for example, poison – save or die, essentially...If you save, take a token d6 of damage – you are assumed to have landed on something that broke your fall enough to avoid serious injury, the Hand of God caught you, whatever. If you fail, though, you are assumed to be at 0 hit points...Then make a System Shock roll – if you succeed you are simply incapacitated and very injured. If you fail that then you are actually dead." Excellent rule! If I decide to give up the hit-point-based approach, I'll probably use this. Thanks! "...one might want to distinguish between short falls...vs. falls that are much higher and would be difficult for anyone to survive." Saving throw success means hit point damage based on the distance fallen. Saving throw failure means 0 hit points & System Shock roll to avoid death. When a character falls at least 5 feet but less than 10 feet, they take 1d4 hit points damage unless they roll their Dexterity or less on 1d20. When a character falls at least 10 feet but less than 15 feet, they take 1d4 hit points damage. When a character falls 15 feet or more, they must make a saving throw against Paralyzation, Poison or Death Magic. They take 1d4 hit points damage from the 1st 10 feet they fall. They take 1d6 hit points damage from the 2nd 10 feet they fall. They take 1d8 hit points damage from the 3rd 10 feet they fall. They take 1d10 hit points damage from the 4th 10 feet they fall. They take 1d12 hit points damage from the 5th 10 feet they fall. They take 1d20 hit points damage from each additional 10 feet they fall. They are at 0 hit points – severely injured and unconscious. They must make a System Shock Survival roll or die immediately. If a character intentionally jumps, their fall is treated as 5 feet less than its actual height if they roll their Dexterity or less on 1d20. If anybody sees any problems with this -- other than it just being more complicated than 1d6 per 10 feet fallen -- please let me know. Re: hit points as luck, et al. You are right to a significant degree, but again I submit that they also represent skill and experience, which is irrelevant to surviving a fall. Gravity is gravity, in this case, and while your luck and divine favour are superior, this is already reflected in having a better saving throw. Your hit points should not really factor into whether or not you survive. Note that the system shock roll is not absolutely necessary. I put it in though because (1) I wanted to give those that fail their save a chance to survive and (2) to come up with a way to use the concept a little more, rather than just surviving being turned to stone or being resurrected. It should be pointed out that hit points are a fairly good abstract representation for combat purposes. Indeed, the 1E AD&D combat rules, if all of them are used, are modestly realistic. I might quibble about some details regarding damage, weapon vs. armor adjustments, and so forth for certain weapons, based on my extensive knowledge on the subject, but it is in outline a pretty good simulation (I am of course setting aside how utterly unwieldy, slow and futzy the system is...) Having a lot of hit points due to your high level means that you know how to gauge your foe, roll with the punches, use superior speed and footwork to dart in and out of range, etc., which turns what would be a lethal blow into a bruise or gash. I have no strenuous problem with that approach. My main complaint about hit points is that it conflates several quite disparate concepts (physical robustness, skill/experience, luck, divine providence, etc. ), which is fine for human (or demi-human/humanoid) types fighting one another with medieval style arms and armor, but breaks down in most other situations such as fantastical creatures, or situations like what we are discussing here. In this respect Metagaming’s “The Fantasy Trip” game system did a much better job of handling this sort of thing, since each concept was separate (i.e. your “hit points” were simply your physical robustness – skill and experience were represented by talents that allowed you reduce damage or made your opponents roll more dice in order to hit you. There was nothing for “luck” but such could easily have been house-ruled). Regarding your rules, Ed, I do feel they are too complicated. But you are much further along than I, as I have failed to fix the shortcomings in my idea at all, and give you kudos for sitting down and really trying to think it through. I guess what I am trying to do is take the basic idea I had and come up with a short, concise set of guidelines/rules for referees that would give them a good, consistent toolset for resolving falls and other similar situations where a character’s skill and experience won’t help them, and it is up to their luck and divine favour and superior constitution to survive. Like any good OD&D style rule, it will require a little effort on the part of the DM to apply to whatever unique situation that has arisen, but it should be a good enough set of guidelines to provide consistent, logical outcomes. This would go a long ways towards resolving ridiculous aspects of the D&D rules in terms of falling and perhaps other areas as well. Thanks for having a look at my proposed falling rules. I agree that they're complicated. But they're not too complicated for me because I play AD&D with almost all the rules. (All except the ones I've changed, of course.) However, I've also found a problem with them myself that I've fixed since I posted them. But I won't go further into that unless somebody is so interested that they ask me to. A character who falls 10 feet or more must Save against Paralyzation. If their Saving Throw succeeds, then they take 1d6 Hit Points damage for each 10 feet they fell. If their Saving Throw fails, then they are at 0 Hit Points and must roll System Shock Survival at -1% for each foot they fell (to a minimum of 1%) or die. You take 1d6-2 dmg for a fall of 5´in those situations where you have no control over the fall (0 otherwise). You take 2d6-4 dmg for a fall of 10´in those situations where you have no control over the fall (0 or 1d6-2 otherwise, depending on save). In addition, you take 1d6-1 dmg for every 10' fallen, in addition to the above. For example a fall of 30' would inflict 2d6-4 plus 3d6-3. It's fairly easy to remember and put into practice. The possibility of doing less dmg than btb neatly compensates for the extra 2d6-4, which can be avoided in those cases where a PC can make a save (I actually do a save to get the option of having the PC reduce the dmg by one or two dice), you can allow a PC to jump down 10' without a roll (a controled fall), and you preserve the possibility of zero dmg, although at increasingly reduced odds. GURPS also implemented a neat little 2d6 roll to determine whether a PC suffers some extra dmg, such as sprained ankle, a broken arm, etc... which I implement for dmg above a certain threshold, and when a save is failed. Finally, throw in the 2nd ed. rule of save vs. Death for any one event that causes the PC to lose 50hps or more at once, and voilá, falls are not the end of the world, but no PC will look down a cliff and calmly contemplate whetehr he can jump or not without consequences.